Mio Navman M300 Europe is preloaded with street-level Western Europe mapping for 23 countries and equipped with new SiRFInstantFixII GPS for a faster GPS connection. Mio Navman M300 features a crisp, flat 3.5-inch screen features an intelligent Day/Night display. Spoken motorway exit instructions and lane guidance help navigate busy motorway junctions, working seamlessly with the easy to read maps and pre-loaded safety camera alert data. Slim and lightweight, the Mio Navman M300 Europe is for anyone who wants safe, powerful navigation at an affordable price. Mio Navman M300 Europe has been discontinued. The Mio Navman M300 Europe is equipped with new SiRFInstantFixII GPS for a faster GPS connection and its crisp, flat 3.5-inch screen features an intelligent Day/Night display. Spoken motorway exit instructions and lane guidance help navigate busy motorway junctions, working seamlessly with the easy to read maps and pre-loaded safety camera alert data. Slim and lightweight, the Mio Navman M300 Europe is for anyone who wants safe, powerful navigation at an affordable price. Photo navigation is easy with the new built-in NavPix software which brings a whole new dimension to finding your destination and discovering new places. The Mio Navman M300 Europe uses MioMap, incorporating the very latest Tele Atlas maps for the smoothest, fastest, easiest journey possible. 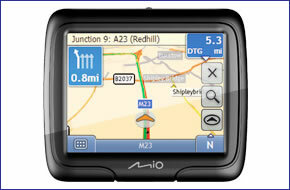 The Mio Navman M300 Europe features SiRF InstantFixII GPS. Gone are the days of making small talk in the car while waiting for your device to find a signal. Coupled with the new Mio software, the powerful new SiRFStarIII GPS receiver has been optimised to hook up with satellites faster than ever before, with no more hanging around. Lane Guidance ensures that you’re always in the correct lane to make a turn. Clear and easy to understand lane instructions show the exact lane to be driven in when approaching turns and exits. With Desktop Local Search, you have a wealth of information at your fingertips. Wherever you are, Desktop Local Search shows you exactly where you want to go, and uploads it directly onto your Mio Navman M300 Europe. The Mio Navman M300 Europe tells you the locations for fixed and possible locations of mobile traps. You can receive both visual and audio warnings. We want you to have the latest maps available on your Mio Navman M300 Europe. Simply register your new Mio Navman with Mio Advantage within 30 days of first use or purchase, and Mio will check if there's a newer map available for your Mio. If there is, you can download it for free! Mio Navman M300 Europe has been designed to be Plug and Play, and as such can be transferred from vehicle to vehicle with ease by the user. The Mio Navman M300 Europe is powered with a 12-volt adaptor cable in-car (supplied) and attaches to your vehicles windscreen via the Mio Navman M300 Europe windscreen mounting bracket which is also included. Mio Navman M300 Europe includes a free 12 month trial to speed camera locations. Mio Navman M300 Europe is complete with the latest Navman TeleAtlas maps providing street level maps for Europe (23 countries): Andorra, Austria, Belgium, Denmark, Finland, France, Germany, Gibraltar, Great Britain, Italy, Ireland, Lichtenstein, Luxembourg, Malta, Monaco, The Netherlands, Norway, Portugal, San Marino, Spain, Sweden, Switzerland, Vatican.